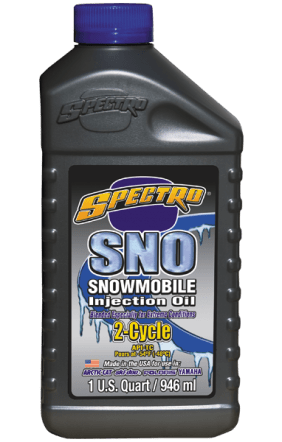 A superior petroleum snowmobile lubricant, Spectro-Sno is specially-blended for all two cycle snowmobile injector systems. Designed to outperform baseline OEM oils, this all-petroleum detergent lubricant offers clean engine operation free from spark plug fouling. Meets/exceeds all known manufacturers’ warranty requirements, Spectro Sno Injector minimizes spark plug fouling, reduces smoking significantly., meets API TC & JASO FB specifications, and is miscible with all OEM oils.